MAG 254 vs MAG 256 vs Others: Which one should you buy? With the massive selection of products available on the internet, deciding what kind of IPTV box you should get can get pretty confusing. This is true at the high end or lower end of quality and price ranges. Lucky for you, you may not have to look much further if you wanted something on the higher end. Check out the new and improved Formuler Z8 (Full Review here)! The Formuler Z7+ is a very well built device that has powerful specs and a wide range of features. It’s not the cheapest product on the market but it is probably the best IPTV set-top box currently available. For what you pay for you’ll be getting a lot. For anyone familiar with popular and bestselling IPTV boxes you have probably heard of the Dreamlink T2. Don’t be confused by the different product names because the Dreamlink and the Formuler are both produced by the same parent company. For all intents and purposes the Formuler Z7+ is the upgraded version of the Dreamlink T2. A good TV box was redesigned for 2018 and made even better. Allow me to explain my personal experience with this device and help you decide if it is the right tool for you. This is a powerful machine and there’s no two ways about it. 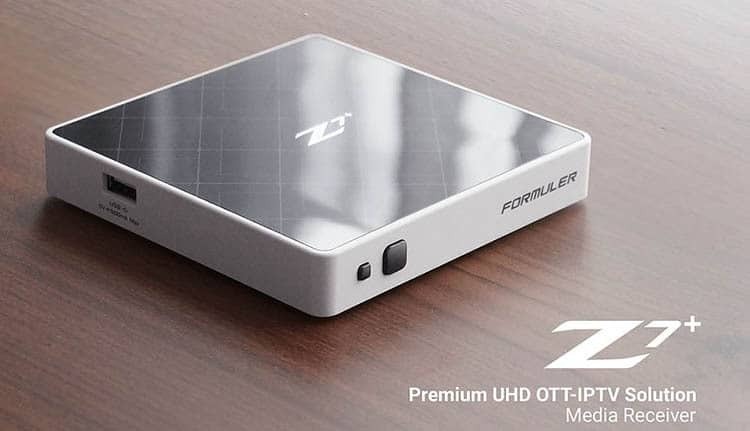 The Formuler Z7+ is a perfect companion to someone with a good internet connection and a premium IPTV service. 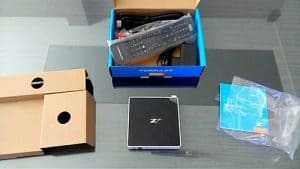 The Z7+ is at its heart an IPTV box that allows you to stream live TV and video-on-demand content from IPTV providers. Many of you will be happy to hear that it rusn Android Nougat 7.1 OS. This system supports all of the latest and most popular apps and is a frequently updated framework. This sets the Formuler Z7+ apart from the popular MAG boxes, that do not run on Android OS and can´t make use of a wide range of apps. Additional hardware specs are equally impressive. It comes with a quad-core processor which simply annihilates many other IPTV boxes, Android compatible or not. It comes with 8GB of internal storage but like all the best boxes has a micro SD card slot to expand the memory. Not only is the picture quality great but so are the audio capabilities. Audiophiles will be glad to hear that the Formuler Z7+ supports up to 192khz sampling rate. Any high-resolution audio files you have lying around will be right at home on this device. PVR functionality is also included which is a must have if you’re the type of person who wants to digitally record as much of your streaming content as possible. Due to the high definition resolutions, you will very likely need to make use of its micro SD card slot for extra storage. 8GBs can get used up pretty quickly when you’re dealing with 1080p, let alone 4K quality. One of the most exciting hardware features of the Formuler Z7+ is the extra RAM it has over its Dreamlink predecessor. RAM stands for random access memory and the more RAM you have the faster your device can load up and access various programs or applications. We’ll discuss it in more detail later but just know that this machine sports 2GBs of DDR4 RAM. DDR4 is the current standard of RAM and it makes a big difference over having, let’s say, 1GB of DDR3. 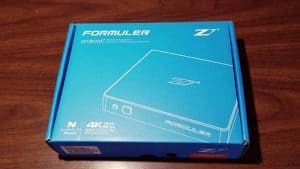 The first thing I noticed when opening up the box was the size of the Formuler Z7+. Despite all its capabilities, it is a very small box. It has a hefty weight to it, however, which is a good thing. It feels very sturdy and durable as if crafted by high-quality metals and plastics. It weighs about 1.25 pounds. There are two colors available, black and silver. I find the silver coating much more appealing but unfortunately, I could only obtain the black one. It still looks sleek and will at least match the colors of my television and various other devices hooked up to it. I recommend trying to get the silver color if you can find it as there is always a unique novelty factor to a piece of hardware with a different look to it. The ports are all nicely spaced out between each other which reduces the odds of cable cluttering. The USB port sits all by its lonesome on one side of the device away from the HDMI port, the power input, and the micro SD slot. This is likely because they couldn’t fit everything on one side but it causes no inconvenience. The remote control really impressed me. Normally I find IPTV boxes to come with fairly low-quality remotes but this is not the case. The controller itself doesn’t feel particularly hollow like many other remotes. I haven’t dropped mine but it definitely gives the sense that it will be much harder to break than others. The buttons are also very satisfying. Instead of being made of the kind of fragile mushy plastic that they’re normally made out of, these buttons are made from the same plastic the body of the remote is comprised of. They feel durable and responsive and have a tactile sensation that lets you know they are going to last. Some might complain about the remote being too big but I personally enjoy the size. Many companies care so much about portability that this mindset carries over to the remote as well. Unfortunately, this results in buttons that are too small or a remote that can get lost easier. The Formuler remote is the same size as your average TV remote and that was a smart decision. Another cool bonus is the remote control extender. It’s a little wired device that plugs into the Formuler box and has a cable range of about a couple of feet. I didn’t need it for the way my room was set up but it’s a very convenient little extra tool in case your room is more spacious or if you’re getting weak infrared signals for whatever reason. Two things instantly ran through my mind when I first started using the Formuler Z7+: the Wi-Fi speeds and the on-device load times. My bedroom’s television is on my floor and my router is in my basement. This is a typical setup that applies to many of us. Even though I prefer wired LAN connections for slightly better speeds and less connection drops, it is a hassle to plug in my Ethernet cable upstairs. If you share this inconvenience then do I have good news. The connection is very stable and has a decent wireless range. Downloading apps from the Play Store took very little time at all. Use a modern Router that has advanced features like QoS to prioritize video content. Check out our recommended Routers for Streaming. If you are using a Wifi connection, be sure to check out our 9 easy steps to improve your Wifi for Streaming. Some Internet Service Providers throttle video streaming traffic without telling their customers. A VPN encrypts all your traffic and circumvents throttling, blocking and geographical restrictions. It isn’t the strongest or fastest Wi-Fi connection I’ve had with an Android IPTV box and I think this is due to the lack of an external antenna. Nevertheless, I found the Wi-Fi capabilities to be more than adequate. As long as your connection is good then you can stream 4K content with little problem besides a few drops here and there. The power of the 2GB of RAM becomes apparent from the moment you press the power button. The loading screen is quite short and the time it takes to open apps, enter the settings menu and switch pages is even faster. 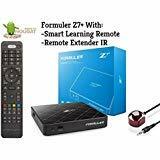 My Smart TV is a sluggish snail in comparison to the Formuler Z7+ when using apps like YouTube or the integrated IPTV player. Starting and exiting videos as well as browsing the catalogs is so much faster. All this extra time really adds up in the long run if you use these apps often. The looks of the UI are decent with basic colors and basic framing of how the app thumbnails show up. But one feature I really liked was the Market page which gives you a list of various programs you can download like YouTube or Google Chrome. It even lists streaming based programs like Terrarium or Kodi. This ability to stream from IPTV services right out of the box is such a huge convenience especially for newcomers to IPTV streaming. The picture quality is about as wonderful as promised. The first thing I did was look up YouTube videos with 4K HDR and the results were great. Results do vary based on what television you’re using but you can rest assured the Formuler Z7+ will push your TV to its limits. One last feature I want to discuss which I found very cool was the ability to turn your smartphone into a portable screen. It’s a great way to use your phone’s on-screen keyboard or when I wanted to move into the connection and bring my content with me. As long as I wasn’t too far away from the box the connection remained solid. My time with the Formuler Z7+ was full of satisfaction. While I wish the Wi-Fi signal was a little stronger, everything promised was delivered with great success. Picture quality, the built-in catalog of apps and load times were all superb. There are always high expectations for a device that comes out in the current year but I can safely say that anyone looking for a high-end internet-streaming experience will find much to love about this IPTV box. Previous Post Xiaomi MiBox Review: Android TV Box Done Right Next Post 5 Best Chromebox You Can Buy Right Now!